Contact us (well, really, just "me"; my kitty can't read or type!) with questions about this site, comments, suggestions, etc. 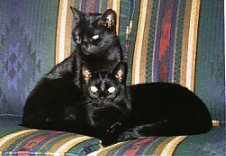 Tell me what you think about MyHealthyCat.com and what other articles you'd like to see. I get emails every day with questions about cat health or stories about your favorite cats and kittens. I love to hear from you! But please note, that I am a cat lover like yourself, not a veterinarian, and I cannot give you veterinary advice. If you suspect that your cat or kitten is sick, please contact your trusted veterinarian immediately. Please do not write to me asking for veterinary advice. If you don't have a regular vet, you can use the blue box below to contact a veterinarian and ask you question right away. Use this link to learn more about us. Use the box below to contact me. Yes, it's OK to post my message, but not my real name. And don't worry. I will never, ever sell, trade or otherwise give your email address to anyone else. I promise!